Please note that certain GDPR features must be enabled in order to be seen and used within RepairShopr. 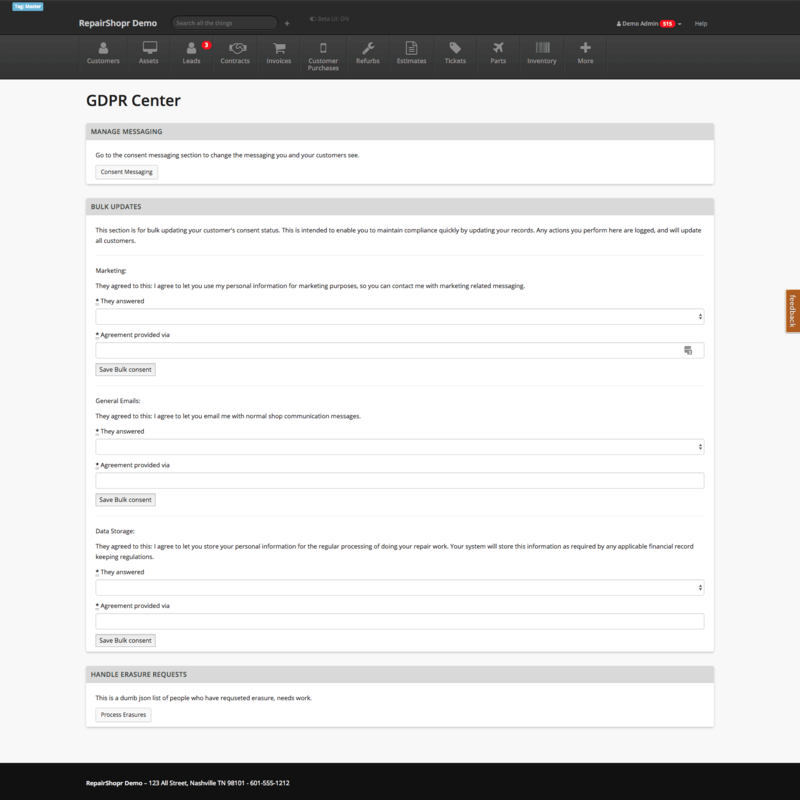 To enable, please go to Admin > GDPR Center > and check-mark the box "Enable GDPR Functionality." To reliably track consent in RepairShopr, we have provided a few new features. If you don't check the first box which says you have their consent to at least store their information for normal business processes, the form won't be valid to continue. The Consent Tracking Section will show opt-in and opt-out history, the source (where from, also the tech that performed the action if applicable), the wording they agreed to, and a time stamp when the customer agreed to it. IMPORTANT NOTE: When modifying Consent you must select options for all 3 as they will update when you click Update. In case you've already been collecting consent outside of RepairShopr, or you are importing Customers that have consented elsewhere, we've provided a bulk consent tool. This tool is in Admin -> GDPR Center. It allows you to mass-update each type of consent for all Customers in the database. Best Practice: We recommend sending out your GDPR Consent Campaign first, then after it has been sent, head to the bulk consent and opt-out your database. That way, only the customers that provide consent from the email campaign will continue to receive your marketing and those that don't are opt-out correctly. We placed a GDPR Consent Template that can be used to seek consent from all of your customers. Head to the Marketr Tab and scroll down to the templates. You will see the GDPR Template in the top row. There is a new tag that can be used for your customers to quickly give consent in one click! We don't provide a tool for this, but if RepairShopr is breached you can be sure we will report to you per the GDPR rules. We can't offer specific legal advice here but you may want to have a policy ready that says how you will respond to a breach. We feel it's a little unclear if every small business needs to build all these policies. RepairShopr will publish a list of relevant hosts and services online here, you may refer your Customers to this or create your own pages. We are not 100% clear what would make you compliant in this regard.